An alternative to hiding cables and cords. JustTSK via Imgur. Click for original. Without a massive entertainment center or at least some kind of cabinet to hide your cables and cords behind, the area surrounding your home theater setup might look like a cluttered mess. The more electronics you have, the more difficult it is to keep things tidy. We feel your pain. More importantly, we found a potential solution. Over on Imgur is a worklog showing how user JustTSK cleverly routed the cables from his various game systems to his TV without hiding them. He took the exact opposite approach by deciding to proudly display all of his cables. Normally cables and cords aren't much fun to look at, though in this instance he arranged them like traces on a printed circuit board. 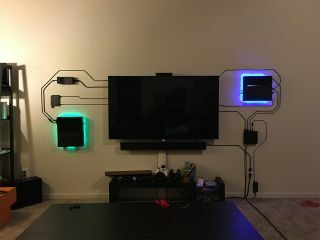 He also mounted his systems to the wall on both sides of his TV and added some under glow. It's pretty neat to look at, though if he ever has to swap out a cord, he'll probably end up with paint chips all over the floor. That's because he used Super Glue to get the cords to stick to the wall after hot glue failed to get the job done. For everything else, he used a combination of brackets (including one he built himself) and double-sided 3M Scotch tape to mount his Xbox One, Steam Link, PlayStation 4, and PS VR box. The same thing could also be done with a mini PC like the Zbox systems that Zotac sells, or any number of console PCs that are out there. You can check out the full worklog here.